ppkwok: 10 Habits to Save the Environment (and Money) In Your Own Home. 10 Habits to Save the Environment (and Money) In Your Own Home. I call these ‘habits’ because saving the environment is not a one-off endeavour, we need to be doing them everyday for it to work. These habits take a bit of effort to start with, but once it becomes your habit, they will become totally effortless. We all know that electrical appliances on standby consume ‘phantom power‘, the real hassle is going around the house to switch them off one by one. Instead, if you plug a number of these appliances into one extension cord which has a master switch, you can switch them off in one flip. Perfect candidates include your TV, cable box, DVD/music player combo, as they are usually co-located and can be easily grouped together. Its all about habit, once you’ve started flipping that switch a few times you will do it automatically every morning. Sometimes we forget to turn off our heater when we leave for work. The easiest solution is to install a timer to switch it off when you leave work, and switch it back on before you come home. That way, your house will stay nice and warm while conserving energy. Most computers come with an option to switch between balanced, power saver and high performance energy consumption modes. 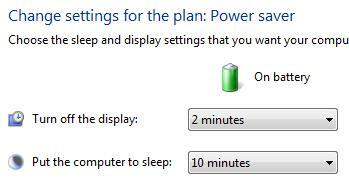 It lets you decide how much idle time should elapse before it switches off the monitor or puts the computer to sleep. If you are frequently leave your computer idle for long periods of time, set the time to 5 minutes or less. Most detergent on the market nowadays wash clothes in cold (~30C) water as clean as it does in hot/warm water. It takes a lot of energy to heat up the huge amount of water in the washing machine, so you will definitely save money washing cold. Of course, make sure you don’t wash just one or two pieces of clothing each time. Most paper bills are at least 2 pages long, and if you have phone, mobile phone, electricity, gas, cable/internet, mortgage, and credit card bills, and bank account statements mailed each month, that’s 16 sheets of paper a month (plus the envelopes and stamps), 192 sheets a year. A city of 1 million households wastes 192 million sheets of paper a year! Most companies offer paperless billing options, and often give you financial incentives to enrol. Once enrolled, you will see a lot less paper stacked up, and you will receive the bill much quicker by email (you will also not be subject to possible postal service strikes). You need a good system to make s ure you don’t just ‘read and forget’ the bill email. If you will forget to pay it without seeing the bill, pay it the moment you receive the bill email, or enrol in direct debit. If you don’t pay it immediately, either mark the email ‘Unread’, or setup some monthly reminder in your mobile phone to pay the bills. Note, however, that at times you will need a utility bill as proof of address. Switch all your bills to paperless, but leave the statement of one bank account as paper bill, as it will serve as both proof of address and of income. You will normally receive the paperless bill as an electronic PDF file, just remember to save it to your computer or to your email account, in case you need to print it out later. Back up your files regularly to one of those finger size USB drives, their advantage being rewritable, unlike CDs or DVDs. You often cannot avoid getting receipts for grocery shopping or restaurants, but you can reuse the back of these receipts as notes instead of buying post-its, or at least recycle them. However, make sure you don’t give receipts that have credit card numbers to other people. Most newspapers and magazines offer online subscription, and most of them are cheaper than the mail delivery option. A lot of people prefer reading on physical paper, but if you don‘t mind, going online can massively save the forests. These publications have lots of pages, and although most newspapers are printed on recycled paper, the process of recycling paper itself consumes energy and is therefore bad for environment. Habit 8 - Recycle ALL Containers, Or Everything! If you look at your trash, it consists mostly of containers you get from various places. Most people recycle, but only things that can be recycled without extra processing, e.g., paper and empty bottles. Items like plastic meat containers, used detergent/shampoo bottles, food cans, juice cartons, glass containers for sauces, and pizza boxes are often simply thrown away. Just a little extra effort to rinse them (takes at most 1 minute) will make recyclable. You will also be creating much less trash. In general, any type of container you get from the grocery store is recyclable with a little effort, and should not end up as trash. Only items like used tissue paper or food residues should end up as trash. Lets face it - we’ve all had food that turned bad in the fridge, because we bought too much. With proper planning, we should know how much food we will consume in the coming week or days. Not only are we wasting food and money, the more food there is in your fridge, the more energy it takes to keep them cool. Make sure you only buy groceries you will consume before its expiry date. I don’t think it’s a sin to get a plastic bag from the grocery store, as long as you will reuse ALL of them as trash bags, because then you don’t need to buy trash bags. However, make sure you don’t get too many plastic bags, and you can do that by buying only the groceries you need, and by packing more into one plastic bag. Say if you need 2 trash bags this week, then get 2 plastic bags, and put the rest of your groceries into a reusable shopping bag. In fact, if you are recycling all the containers from the grocery store, you really should not need more than 2 or 3 plastic bags for trash a week.